SAN FRANCISCO, Nov. 29 /CSRwire/ - The EnCorps STEM Teachers Program was honored at Silicon Valley Education Foundation’s (SVEF) 13th annual Pioneers & Purpose Celebration for Education on Wednesday, November 8 at the Fairmont San Jose. 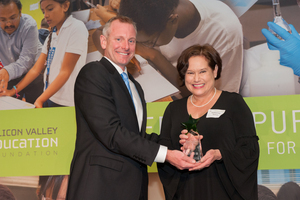 During the celebration, EnCorps’ Executive Director, Katherine Wilcox, and San Francisco Bay Area Program and Recruitment Director, David Taus, were presented with SVEF’s 2017 STEM Innovation Award. The other award recipient was Women’s Audio Mission. The STEM Innovation Awards are awarded in recognition of pioneering organizations and programs in science, technology, engineering, and math (STEM) education that set new benchmarks for innovation. A $5,000 prize is awarded to winners. EnCorps was recognized for recruiting and supporting highly qualified STEM teachers in high needs Silicon Valley schools. The STEM Innovation Award winners were selected by a group of thought leaders who have demonstrated outstanding work in the STEM community. The 2017 selection committee included Tom Baker, SVEF Board Member and Chairman of the Selection Committee; Gabriel Alcantar from Langan Engineering; Karl Glaub from Google; Eric Heitmann from CBRE; Kira Walter from Google, and Winnie Yu from Flex. EnCorps places experienced science, technology, engineering and math (STEM) professionals as teachers in high needs, low-income public schools, ensuring equal access to quality STEM education and inspiring children to pursue STEM careers. EnCorps serves middle and high school students in Los Angeles, Orange County, Sacramento, San Diego, and the San Francisco Bay Area, with demand to scale nationally. To learn more about EnCorps and how you can support the program, please contact Director of Development, Grace McGlade at grace.mcglade@encorps.org. Silicon Valley Education Foundation (SVEF) was founded on the belief that a new kind of organization is needed – one with a different philosophy and approach to the challenges in legacy systems. A nonprofit resource and advocate for students and educators, SVEF is dedicated to putting all students on track for college and careers, focusing on the critical areas of science, technology, engineering, and math (STEM). SVEF helps through Advocacy – working with school districts to promote best practices and policies; Programs – offering direct programs and support to educators and students; and, Innovation – placing cutting edge EdTech and resources into live classrooms.